Keeping up with the latest trends isn’t always easy because things go in and out of style so quickly. While Ombre hair was all the rage only a few short weeks ago, there are already new trends in position to take its place. Of course some things never go out of style. The top hair trends of 2012 are a mix of the old and the new. Some old standards are getting a fresh spin while entirely new products are hitting the market and making new trends all their own. Let’s take a look at the ten hottest hair trends for 2012 and the celebrity hair trendsetters who are wearing them. I remember hair twists from way back in the day but thanks to the beautiful and talented Miss. Evan Rachel Wood, this hairstyle is coming back in a big way. The great thing about twists is that they’re incredibly easy to do and can really work for any hair length. If you have longer hair, just do a few twists to add a little flair to an otherwise plain style. Short haired ladies can do all of their hair in twists (like Evan has done in the photo above) to add a cute, classic and elegant feel to their short cropped locks. This is a great look and I’m thrilled to see it has made a comeback. There are lot of great products out there for quickly adding length and volume to your hair but few are as easy to use as tape extensions. Relatively new to the market, tape extensions are quick and easy to apply but hold up beautifully for weeks on end; offering not only convenience but real quality. Stars like Kim Kardashian swear by them and have helped these particular products become one of the hottest hair trends of 2012. There is nothing about this look I don’t love. It’s classy and sophisticated yet still fun and youthful. What really appeals to me about this particular look though is that it is extremely versatile. It can be paired with a nice formal outfit for dressier occasions but can also be paired with casual attire for every day wear or more low-key functions. Rachel Bilson has pulled this look off beautifully in the photo above, adding some beautiful soft curls for an extra romantic look. If you want to go even more casual than Rachel has, skip the waves and go with a messier, less polished side bun. 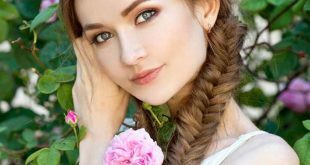 Fishtail braids are still popping up from time to time but that trend is definitely on its way out. Of course any fashion savvy person knows there is always something new and exciting happening with braids and this year, that new exciting trend is the braided up-do. I’ve said it before and I’ll say it again. Braids will never go out of style. The style will just continue to evolve. Braids are classic for a reason, after all. Braided up-dos are great because they’re fairly easy to do, they can be casual or formal, they’re fun and flirty and they don’t require a whole lot of product. They’re also mighty comfortable. This is by far my favorite trend this year and Sienna Miller (shown above) is a great example of how it’s done right. Just like braids, bobs are classic and will probably never go out of style but they do change and evolve over time. Remember the pob (Posh Bob, named for Posh Spice)? The lob (long bob)? So over! This year is all about funky, choppy layers which is great news for you ladies out there with medium length hair. This one is a great transition hair cut as well, helping you move from a shorter cut to longer locks in style. Dianna Agron started sporting a layered bob a few months back so I’ve had my eye on this one for a while. I’ll admit Dianna’s career isn’t as red hot as I would’ve expected when Glee first hit the airwaves but trust me when I say Dianna is an absolute trendsetter when it comes to hair. Whether dressing up a pixie cut or adding a classic touch to long locks, headbands are coming back in a very big way. I suppose in many circles they never really went out of style in the first place. Fat headbands, skinny headbands, colorful headbands, printed headbands – it doesn’t matter. There is a headband out there to suit nearly every hairstyle. One of the great things about headbands is their versatility. It was once thought that headbands were only good for little girls or women who wanted to recapture their youth but in the photo above, Charlize Theron proves headbands can also be beautiful and sophisticated. I have to admit I’m a little sad to see blunt bangs go the way of the Pob as I am a huge fan of the look but all good trends must come to an end. That doesn’t mean bangs are out though. It just means the new trend focuses more on softer, wispy bangs instead of the harsher, heavier blunt bangs. Wispy bangs do offer a lot of benefits over their blunt counterparts though. Wispy bangs are more flattering to a wider variety of face shapes and their softer, more romantic feel makes them a little more versatile. Reese Witherspoon is a great example of how complimentary wispy bangs can be. This is an amazing look that is quickly gaining popularity but it probably isn’t a look you’re going to be able to do at home, unless, of course, you happen to be a stylist. Of course two tone color has been popular for a while now, especially with Ombre hair, but this is really just the next step. Face framing highlights aren’t for everyone but lovely light highlights around the face can be a beautiful look if you choose a color that compliments your skin tone, as Jessica Biel has done (shown above). While you’ll likely need a stylist to help you pull off this look properly, it’s still a great option as your stylist can also help you decide on the perfect shade for your overall color as well as the highlights. Don’t listen to those that say straight Ombre color is out though. It’s still definitely a trend to watch this year. While it’s often said that certain complexions should stick to either warm or cool shades, there are exceptions to every rule and finding a warm shade that compliments your skin tone isn’t impossible. If you have a skin tone that is more suited to cool shades you may need to do a little more work to find an appropriate color but when it doubt, consult a stylist. This year, warm shades are all the rage so if keeping up with trends is important to you, the time it takes to find the right shade will be worth it. Aside from that, a beautiful warm color that works for you can be absolutely breathtaking. Curls or waves are always a beautiful look for women with nearly any hair type but this new trend gives this classic look a fresh spin. This popular hair trend for 2012 offers a more polished look than other wavy styles we’ve seen in the past while still offering a simple, romantic feel. The hair has less of a curl than with traditional waves and falls a bit flatter against the head. Miranda Kerr (shown above) wears this style beautifully, complimenting the shape of her face and giving herself a youthful, trendy look. Get This Look: This is actually a pretty easy look to copy and you won’t even need to visit the salon to make it work. Start by dampening your hair just before bed. You don’t want your hair to be dripping wet. Just damp enough to say it is no longer dry. Spray your damp hair with a spray styling gel if you have it. If you don’t, use a very small amount of normal styling gel, making sure you work it through your hair from root to tip. Braid your hair into four fat braids and secure them at the ends. Go to bed. When you wake up, take out the braids and admire your lovely, low effort waves. Finish up by defining your waves with a one inch curling iron and you’re good to go. If you’re in a rush, skip the curling iron. Your waves will still look great.